When it comes to noseless toy dolls that could have a devastating effect on the minds of the young women who play with them, it’s admittedly hard to beat the Bratz franchise. These noseless girls who dress a little too old for their ages (which I think is high school age, I guess), and they’re a big dumb part of 2000’s culture. Thus, the Bratz Challenge enters our mental sphere, and The Bratz Challenge is taking Instagram by storm. Bratz Dolls were the “it” dolls of the early 2000’s. Their clothes were on point, their eyes were big and their lips were glossy plump pouts. The dolls were often called out for sexualizing young girls. 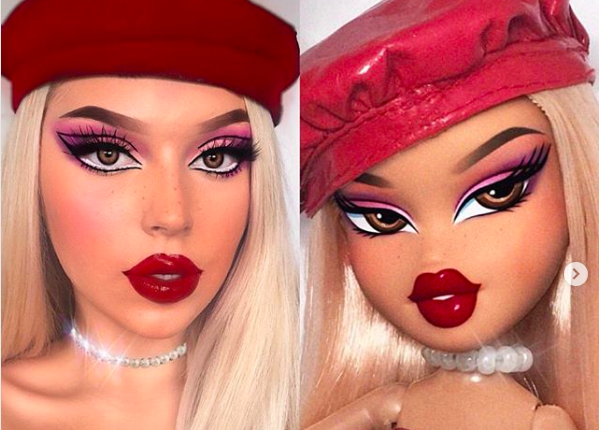 Someone even made a Facebook page called “Bratz dolls are the sluts in every Barbie dream house.” Despite the controversy, many people credit the dolls for a lot of todays hottest beauty trends. The designer of the dolls calls them “edgy and on the cutting edge,” and told Vice they aim to make them “ethnically ambiguous”. People regularly call Kylie Jenner a “real life Bratz Doll” due to her trademark big lips, chic style and curvy body. 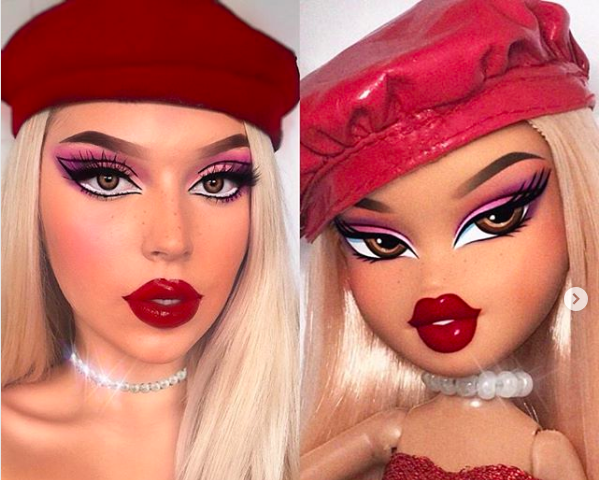 Most recently, the dolls have inspired the “Bratz Challenge.” This is when people do their makeup to imitate the dolls. Check out some of our favorites in the video above. Although, if you’ve got a nose, you’re still one step behind the Bratz dolls. Sorry, some plastic forms of beauty are simply impossible to ignore. Do you think Bratz have influenced our culture? In a good way or bad way? Also, would you do this challenge? Let us know in the comments or on Twitter at @WhatsTrending. Also, if I could look like any doll, I would look like one of those Yo Gabba Gabba dolls. Maybe the one that had a party in his tummy. My #1 guy!